Foreign Minister Taro Kono said Monday that Japan, together with South Korea, will continue to maximize pressure on North Korea until Pyongyang takes concrete action toward the complete abandonment of nuclear weapons and missiles. 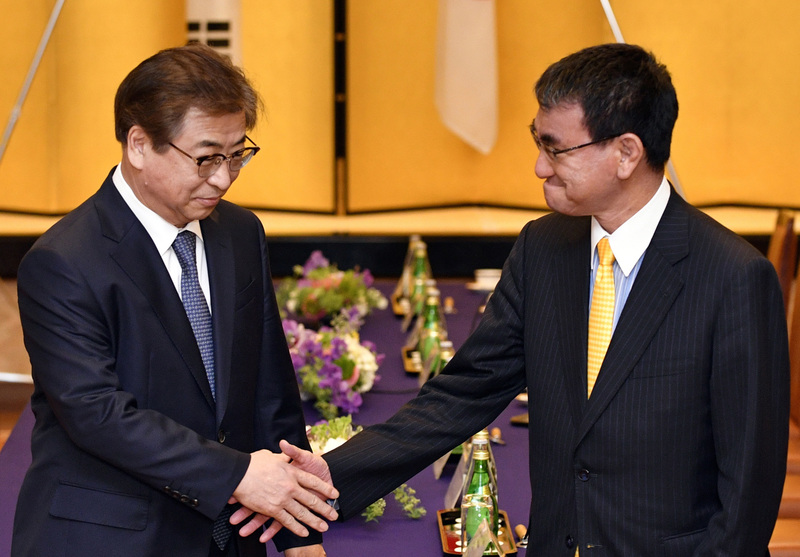 Kono’s comment followed his meeting with Suh Hoon, the director of South Korea’s National Intelligence Service, who is visiting Japan to brief Tokyo about his historic visit to North Korea. “The current change in North Korea was achieved by the maximum pressure campaign conducted together by Japan, South Korea and the U.S.,” Kono told reporters soon after the meeting, which lasted for almost three hours. “Through the inter-Korean summit and the U.S.-North Korea summit, we must encourage Pyongyang to take concrete action,” he said. 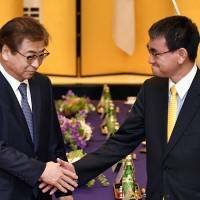 Kono also said Japan and South Korea agreed to cooperate on solving the abduction issue, referring to the Japanese abducted by North Korean agents in the 1970s and ’80s. The issue is one of the top priorities of Prime Minister Shinzo Abe. Kono said he was briefed on the details of Suh’s meeting with the North’s leader but declined to provide specifics. Suh is scheduled to meet with Abe on Tuesday. Last week, North Korean leader Kim Jong Un and envoys dispatched by South Korean President Moon Jae-in agreed at a meeting in Pyongyang to hold an inter-Korean summit late next month.